The Harley Gallery, on the Welbeck estate between Nottingham and Sheffield, has announced its 2018 exhibition schedule. It will begin the year with a photographic celebration of 250 years of the Circus; followed by exhibitions in glass, sculpture and porcelain; before closing with Kate MccGwire’s ethereal sculptures. For anyone who has ever dreamt of running away with the circus or simply wondered what life is like for the jugglers, clowns, and acrobats, a new exhibition at The Harley Gallery by acclaimed photographer Peter Lavery captures what goes on behind the scenes at the Big Top. Lavery has spent the last 50 years following circuses the length and breadth of Britain and Ireland. 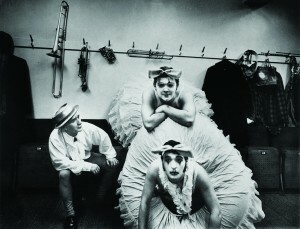 His intimately detailed, large-scale photographs, taken in both black and white and colour, show circus performers relaxing while off duty, practicing, getting ready to perform, part made-up and costumed, and revealingly off-guard. The son of a miner, Lavery has developed an enduring interest and passion for his subject since dropping in on a small indoor circus in his home town of Wakefield in 1968. ‘Circus Work’ is part of Circus250 a UK-wide celebration of the first circus near London’s Waterloo in 1768. Shedding light on life at Welbeck, ‘Half in shadow: Half in light’ reveals the push and pull of time on the historic ducal estate through a series of lithopanes. Lithopanes became popular in the early 1800’s as their hidden three-dimensional images become visible only when the thin porcelain plate in placed in front of a light. Just as the lives and work of generations before shape modern life at Welbeck, so too will this old technology frame the telling of Twomey’s modern stories from the estate. One of the World’s greatest living jewellers, Paris-based Joel Arthur Rosenthal, known as JAR, selects a new display from The Portland Miniatures, regarded as one of Britain’s finest collections of miniature portraits and part of the internationally renowned Portland Collection at Welbeck. A highlight of the exhibition is a pair of mourning rings made for Edward Harley and his wife Henrietta in 1725. Made to commemorate the life of their son who lived just four days, the rings were last known to be together in 1786 – this exhibition will bring them together for the first time in over 230 years. One of these beautiful rings has been in The Portland Collection for nearly 300 years; the other belongs to JAR himself. This ring descended through a different part of the family before being sold, and disappeared until 2016 when JAR visited Welbeck and saw the partner ring. Both rings feature an intricately enamelled band with a precious gem; one emerald, the other sapphire. Over the last five years National Glass Centre has worked with some of the finest contemporary British based artists working in glass. This exhibition presents work by a selection of these artists, including Emma Woffenden and Louis Tompson. National Glass Centre is located in Sunderland and celebrates a relationship with glass dating back to 674AD when the first known coloured glass window arrived in the country. The city became home to numerous bottle works and glass making companies including James A. Jobling & Co., who made all pyrex glass supplied to the British Commonwealth countries until 1997. A new, ‘human-scale’ sculpture by Laura Ellen Bacon will twine its way around the ground floor gallery. Working with natural materials, such as willow or thatch, Laura Ellen Bacon knots, weaves, twists and plaits by hand to create monumental site-specific sculptures. They envelop and embrace their surroundings, yet despite their scale, the intricacy of Bacon’s work creates a nest-like intimacy. Her forms are at once strange and familiar, straddling the natural world and the man-made. MccGwire is an internationally renowned British sculptor who uses natural materials to explore the play of opposites at an aesthetic and visceral level; familiar yet otherworldly, beautiful yet disgusting; tranquil yet malicious.